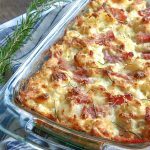 This Low Carb Chicken Cordon Bleu Casserole is an easy low carb dinner recipe made with cauliflower, ham, chicken, covered in a creamy dijon sauce. Note: Approximately 7 net carbs per serving. Add 3-4 cups of water to a large pot and add the chopped cauliflower to it. Bring the water to a boil and steam the cauliflower until it just begins to soften but still has a little crunch to it about 5-7 minutes. In the same pot melt the butter over medium high heat. Add heavy cream, dijon mustard, and garlic cooking for 3-5 minutes until cream is warmed through. Sprinkle the xanthan gum over the liquid whisking the whole time to keep it from clumping. Stir the yolk in a small dish, then add a bit of the warmed cream to it whisking to temper the egg and keep it from cooking as you slowly add it to the cream mixture whisking the whole time. Keep whisking the cream as it begins to thicken, about 10 minutes. Add the Gruyere cheese and ½ cup of the Parmesan . Stir the mixture until it is fully combined and then let it cook for another 5 minutes. Salt and pepper to taste. Add the ham, chicken, and cauliflower to the mixture tossing it gently to fully coat it then spread it evenly in a greased 9 x 13 casserole dish. Top with the remaining Parmesan cheese and cover with aluminum foil before putting it in the oven to bake for 25 minutes then remove the foil and put it back in the oven to bake for another 15-20 minutes or until it is hot and bubbly and heated all the way through. Remove from the oven and let stand for 15 minutes then serve.